Subtitle: When President Bush announced that he had ordered the Pentagon to prepare for nuclear war with 7 countries, he threw a nuclear protection ring around Israel. Why? "The Bush administration has directed the military to prepare contingency plans to use nuclear weapons against at least seven countries and to build smaller nuclear weapons for use in certain battlefield situations, according to a classified Pentagon report obtained by the Los Angeles Times. The secret report, which was provided to Congress on Jan. 8, says the Pentagon needs to be prepared to use nuclear weapons against China, Russia, Iraq, North Korea, Iran, Libya and Syria. It says the weapons could be used in three types of situations: against targets able to withstand non-nuclear attack; in retaliation for attack with nuclear, biological or chemical weapons; or "in the event of surprising military developments." In U.S. Military Intelligence, I learned the truth about government public announcements. First, when a new weapon or new capability is made public, the reality is that the government has possessed it for at least 10 years; secondly, the Pentagon always has plans drawn up for every contingency known to man, so it would certainly have nuclear plans for these nations. Since this is the case, then why did the Bush Administration make this announcement that caused so much havoc amongst other nations of the world? The most plausible reason for making this announcement now is that President Bush wanted to send a strong signal to all the parties in the Middle East -- and those major nations on the periphery -- that America is prepared to use its nuclear arms to defend its interests in and around Israel. In fact, I believe that President Bush has just thrown American nuclear might around Israel, to protect her in the event of war. Perhaps Bush and his advisers believe that Iran, Iraq, Egypt and Syria would be more cautious about attacking Israel in a concerted war move if they knew of America's support for Israel in clear, unmistakable terms. However, arguing against this rationale is the fact that Israel already possesses enough nuclear and neutron bomb capability to annihilate all of these nations; Israel certainly do not need American nuclear weapons threats to make the Arab nations realize they would be doomed in any such war. However, these countries are preparing for all-out war with Israel. Listen to a report from our own House of Representatives on the next Arab-Israeli war, for you will see these very countries mentioned. NEWS BRIEF: "The Next Arab-Israeli War", by Emanuel A. Winston, A Middle East Analyst and Commentator, The Jewish Press, Week of January 31, 1997, Vol. XLVII, No. 5, p. 43 and 53. Therefore, our government has known since at least December 10, 1996, that these countries were planning an all-out annihilating war against Israel. You know that the Pentagon has scripted war under every possible scenario against all countries surrounding Israel. Since this is likely the case, then why did Bush make this announcement just now? Let us look at this region and take each of these countries mentioned in this article one by one. We find it terribly interesting, in the light of Bible prophecy of all-out war in the Middle East during the End of the Age [Joel 2-3] that all these nations but one are either in the Middle East or are on its periphery. "A hair-raising nuclear confrontation in Korea may, towards the end of the period, threaten man's very survival. And above all, there will be the great Chinese war ... Chinese forces will eventually reach the Middle East ..." [Peter Lemesurier, The Armageddon Script, p. 223]. Therefore, we can understand why Bush wanted to warn China not to get involved in this brewing fight between Israel, Iraq, and the United States. Russia -- Right now, Russian troops are fighting a guerrilla war against Muslim rebels in the province of Chechnya. If you look on the map, Chechnya is just north of Iran; Russia would only have to move through the small country of Georgia to be in Iran. We have postulated that Russia may be fighting this war in Chechnya only to forward-position men and materiel for her eventual move into the Middle East. Ezekiel 38-39 demands that Russia will lead a combined army of Russian, European, and Muslim forces into an attack against Israel. Russia has developed, and is maintaining, military and economic ties to each of the Muslim countries mentioned in the prophecy of Ezekiel. This prophecy is only awaiting the proper moment for fulfillment! Iraq -- America is preparing an all-out assault on Iraq, marshaling forces even as we speak. Vice President Cheney is on a 10-day diplomatic tour of the Middle East, informing every nation in the region of our seriousness in this attack, and making sure they know the height, depth, and width of our resolve. DEBKAfile warned on March 10 that Bush had decided on using nuclear weapons to attack Iraq. Further, DEBKAfile reminded us that, on February 22, John Bolton, our Deputy Secretary of State For Disarmament, stated that America had changed our policy -- now we would use our nuclear weapons to attack nations weapons who did not possess nuclear weapons. Bush just reversed U.S. Policy that was enunciated by every President since Eisenhower! This policy shift is major! In other words, Bush had changed our policy so that he could attack Iraq with nuclear weapons. "And I will show wonders in the heavens and in the earth, blood, and fire, and pillars of smoke. The sun shall be turned into darkness, and the moon into blood, before the great and the terrible day of the LORD come." [Parallel Bible, KJV/Amplified Bible Commentary]. This reference to "pillars of smoke" could definitely refer to the distinctive mushroom clouds of nuclear weapons; further, nuclear blasts throw enough smoke, dust, and debris into the atmosphere that the Sun can be blotted out, and that would turn the color of the Moon red. All these are demonstrable physical effects of nuclear weapons. And, God says He will cause this kind of war in the vicinity of Israel "before" Antichrist arises -- "before the great and terrible day of the Lord"! In case you have not noticed, Britain's Prime Minister, Tony Blair, has brought Great Britain into total compliance with George W.'s foreign policy generally, and this Iraq attack in particular. Blair has seemed to be a mirror image of American leadership, first of President Clinton and now George W. Bush. The only question is this: is the policy concerning Israel, Jerusalem, and the entire world generated in Washington and followed by London, or is the policy originated in London and followed by Washington? The importance of this revelation shall be evident at the very end of this article. Iran -- Israel has long been worried about the Iranians. They are worried that Iran will obtain nuclear weapons, or some other Weapon of Mass Destruction. Israel is worried about the terribly destructive attitude on the part of the Iranian ruling clergy. Iran has been implicated time and time again in various plots to destroy Israel and to aid Arafat. She was mentioned in the above 1996 House Intelligence Report in the consortium of nations planning to annihilate Israel. Finally, Iran [Persia] is prophesied to be part of the Russian-led invasion of Israel in Ezekiel 38-39. Syria -- When the present Hassad took over as supreme leader of Syria upon his father's death, I saw many articles stating that now Israel and the United States were hoping Syrian policies against Israel would greatly moderate. This has not been the case. In fact, Syria has taken a pivotal role in preparing for a war with Israel. Reports have indicated that Syrian military units have been carefully moved right up to the border with Israel, ready to attack at a moment's notice. Recent reports have also surfaced indicating that Syria and Iraq have recently signed secret support agreements that would obligate each country to come to the other's defense in the event of an invasion by another country. "The burden of Damascus. Behold, Damascus is taken away from being a city, and it shall be a ruinous heap." [Isaiah 17:1] Archeologists call Damascus the "oldest continuously occupied city on earth". There has never been a time when Damascus has been destroyed; therefore, this prophecy of doom -- this "burden" of doom -- is in the near future. Libya -- At first glance, it seems ridiculous that Bush would include Libya on his nuclear hit list; however, when you look at the map, you can see that Libya borders Egypt. Egypt is a major threat to Israel, and has been tailoring her Army exercises to simulate an attack on Israel for the past two decades. Israel considers Egypt a real threat. However, Egypt is currently in good official favor with Washington, and most of the world knows it. Therefore, it would be very unseemly for George W. to threaten Egypt with nuclear war. However, in the world of diplomatic double-speak, Bush has threatened Egypt by aiming his rhetoric at Libya. Believe me, Egypt got the message. As if to lend credence to Libya being on this nuclear hit list, articles have recently been appearing about Libyan initiatives within the Arab world. Libya is included in the list of nations marching with the Russian-led armies against Israel in fulfillment of Ezekiel 38-39, while Egypt is not mentioned at all. This prophetic fact is curious when you realize that Libya must march right through Egypt to get into position to attack Israel. Somehow, this current state of affairs is going to result in Egypt's destruction so that, when Libya and Ethiopia march through her, Egypt will not be in a position to protest. North Korea -- This country is on Bush's nuclear hit list for good reason. We have been protesting for about a decade now that North Korea is developing all Weapons of Mass Destruction -- Nuclear, Chemical, Biological. Experts concede that she probably wields them all in her arsenal. Bush needed to warn North Korea not to attack South Korea using any of these weapons. We detail all these plans in our section entitled, "Korean Peninsula" off our World War II page. We encourage you to read all these articles, for North Korea is definitely planned to invade South Korea once America is fully engaged in war in the Middle East. 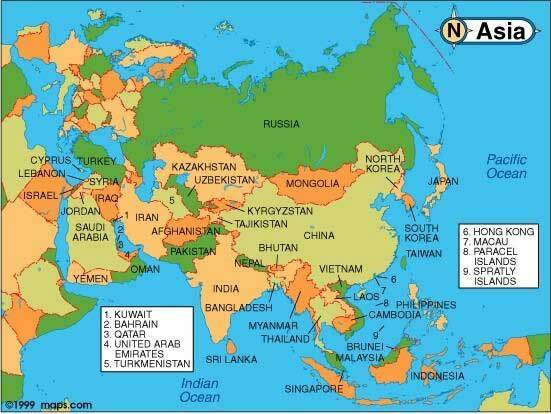 Once again, please look carefully at this map. You will see that President Bush has effectively drawn a nuclear protection ring around Israel. He has protected Israel from the North -- from Russia, Syria. He has protected Israel from the East -- from Iraq, Iran, and China. And, he has protected Israel from the West -- from Egypt, Libya. What possible purpose might President Bush have had in drawing this protection around Israel? One can only surmise what the purpose might be, but the fact remains that he did it. While proclaiming his acceptance of Islam, and insisting that his global war on terror is not a fight against Islam, President Bush has diplomatically and militarily demonstrated exactly the opposite. In this world today, the most spiritually powerful occult forces on earth emanate from Great Britain, the United States and Israel [Read NEWS2128 and Antichrist and A Cup of Tea for more detail]. You cannot find nations more given over to the plan and the power of the Illuminati than Great Britain, the United States and Israel. Together, these three nations plan to unify Jerusalem under international control, re-build Solomon's Temple on the Temple Mount, and establish the Kingdom of their New Age Masonic Christ -- the Hiram Abiff who was resurrected by the Master Mason using the Grip of the Lion's Paw! Masonic legend, in obedience to Biblical prophecy, is driving the events of the day. Antichrist is close, and Britain, the United States and Israel are cooperating closely to make his appearance happen. 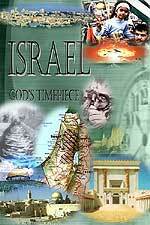 In the process, the House of Esau [Palestinians] are going to be annihilated, Egypt, Syria, and Iraq devastated. Before the Seven-Year Tribulation Period is finished, all Muslims are planned to die at the hands of Israel and the United States. Before this 7-year period is over, all prophecies in the Book of Revelation will be fulfilled. This is a large portion of the ultimate Illuminati goal, and we are watching its progression in our Daily News.